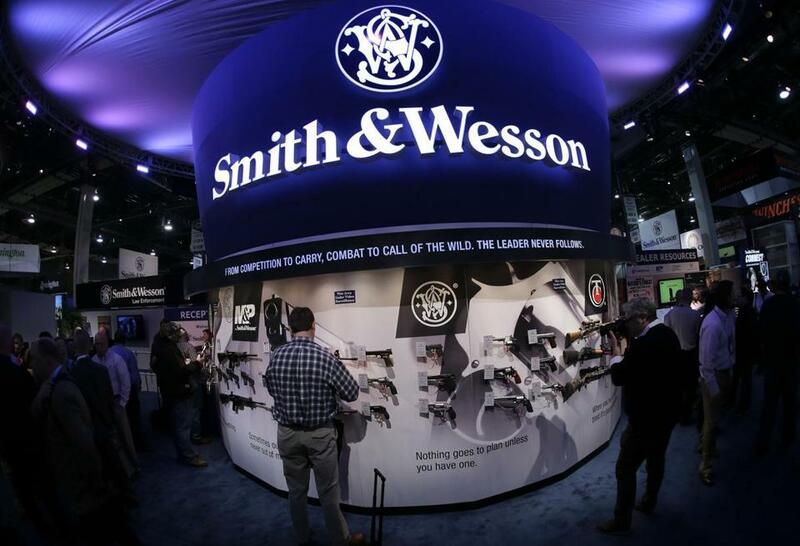 Trade show attendees examined handguns and rifles in the Smith & Wesson display booth. Gunmakers’ stock prices have surged over the last five years amid an increase in mass shootings and heated national debate over how to curb gun violence. There are two major publicly-traded gun manufacturers — Sturm, Ruger & Co. and Smith & Wesson Holding Corp.
Five years ago, Ruger’s stock price was $19.06 per share. Today it opened at $61.95, or 225 percent higher. Smith & Wesson’s stock price was $3.18 per share five years ago. Today it opened at $23.40, or 636 percent higher. By comparison, the major stock indexes rose over that same span, but only by about 50 to 85 percent. There have been numerous examples recently in which the stock prices of gunmakers jumped in the immediate aftermath of deadly mass shootings. On Monday morning, during the first hours of stock trading after the deadliest mass shooting in US history, Smith & Wesson’s stock was as much as 11.3 percent higher than its closing price on Friday. Ruger’s stock peaked on Monday morning 10.6 percent above its closing price Friday. Similar spikes were also seen in the wake of the San Bernardino attack and after another at Umpqua community college in Oregon. But one study suggests that mass shootings might actually have the reverse effect on stock prices — or, at least, they used to. Business professors Brad N. Greenwood from Temple University and Anand Gopal from the University of Maryland examined the performance of the Ruger and Smith & Wesson stocks in the wake of 93 mass shootings in the US from 2009 through 2013. Adjusting for broader fluctuations in the markets, they found that, overall, the gunmakers’ stocks declined in the days after those mass shootings, and that the drop in price was sharper if more people were killed and if a handgun was used. However, when they looked closer at the data, they found that while there was a clear decline in stock prices in the wake of the first half of the shootings studied, there was no statistically significant effect after the more recent half. “This is speculation, but it seems to suggest that mass shootings have become sort of a new normal of what’s accepted and that people investing in the market think the probability of new gun regulation after one of these events is unlikely,” said Greenwood. He said that he and Gopal have looked at analyzing trends in gunmaker stock prices in the wake of mass shooting incidents since 2014. But Greenwood said that mass shootings have become so frequent in recent years that the researchers were not comfortable that they could distinguish any clear effect from the incidents. Gun sales have also skyrocketed. Last year, more than 23 million firearm background checks were processed nationwide, the highest total since the background check system began in 1998, and 64 percent higher than the 14.3 million background checks processed in 2010, federal data shows. “We know that there is an increase in applications for firearm licenses after mass shootings and we know there’s an increase in gun-buying behavior,” said Greenwood. In Massachusetts, tens of thousands of new gun licenses were issued in 2015, continuing a recent surge, the Globe reported in January.